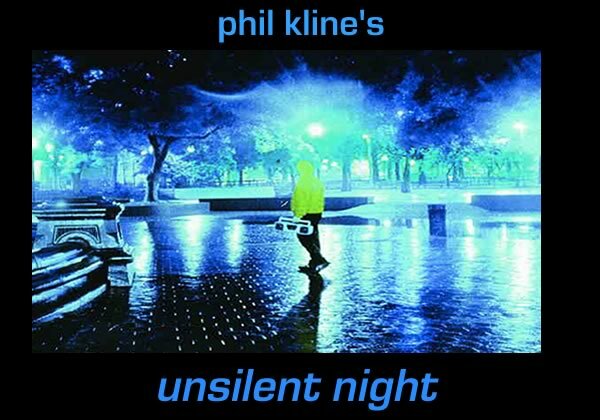 Phil Kline's Unsilent Night + Party! FREE! Presented by Seattle Composers' Salon, Nonsequitur, and Joshua Parmenter. First, download an MP3 file of the music here. You will randomly get one of four possible parts. Don't worry, it doesn't matter which one you get; they are all similar and equally important. Bring the CD/cassette, your boombox, and fresh batteries and you are ready to go! It does not have to be a fancy player - all levels of sound quality are encouraged. Don't have a boombox? You can also use an iPod or other MP3 device, such as a smart phone, with battery-powered speakers plugged in. If you are using an iPhone, you can download the special new appcreated by Josh Parmenter. 6:30 PM - Meet at the Chapel Performance Space up on the 4th floor of the Good Shepherd Center in Wallingford, where we will all load up our players and go over the route. 7:00 PM - We begin a slow-moving procession as a group through Wallingford, lasting about 45 minutes. 8:00 PM - Return to the Chapel for a "New-Music Holiday Office Party", with hot cider, snacks, music, and prizes.